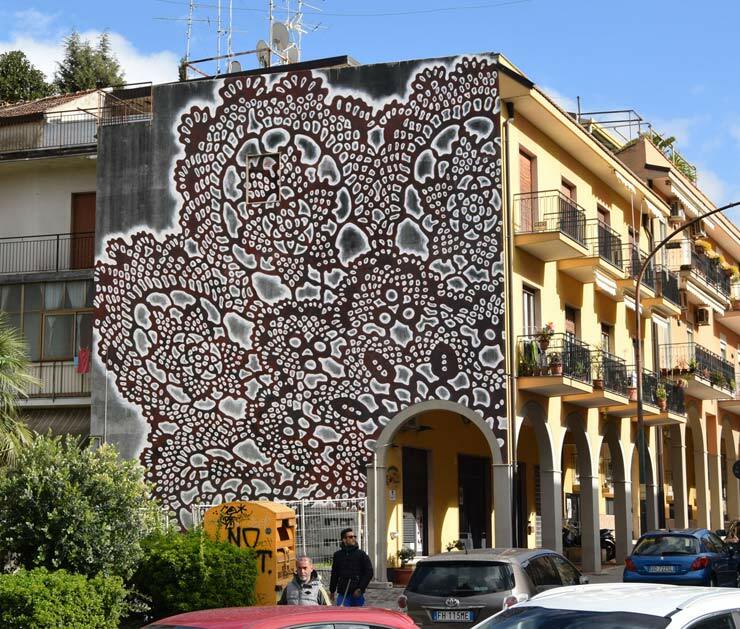 Certainly Nespoon has taken inspiration from the handmade lace in her native Poland in her generous stencil patterns on the sides of buildings that borrow as much from nature and history as they do geometric groupings. 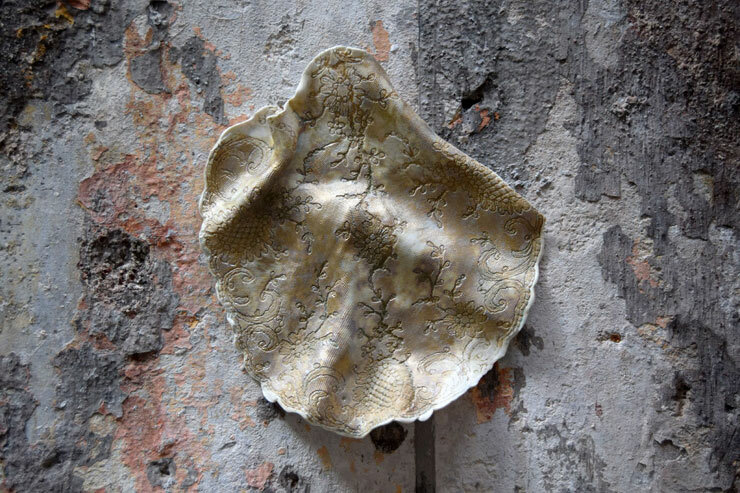 She also has been coupling these large works with smaller porcelain pieces that emulate the weathering of the city skin – and may remind you of underwater crustacean environments, ornate spider webs, or of your Aunt Edna sipping her sherry while surrounded by lace and thick old velvet. 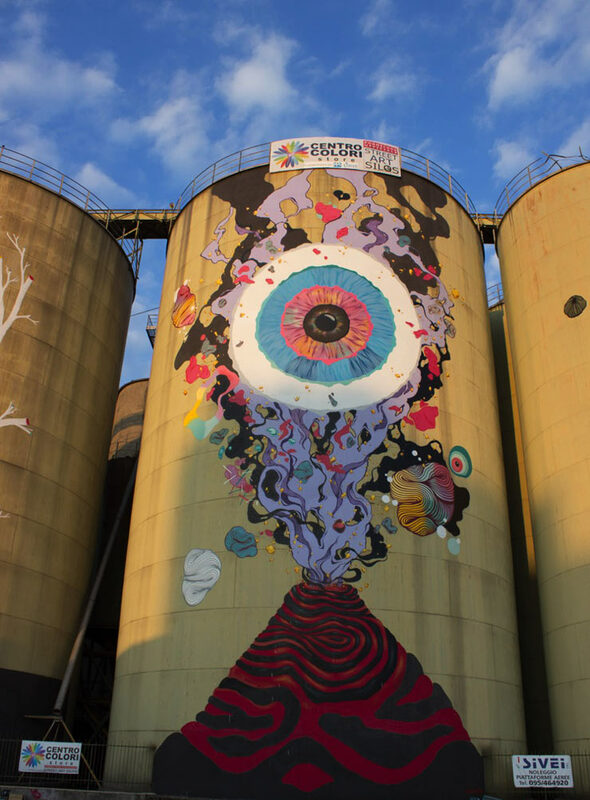 They’ve been here since the 1950s, these silos for wheat and corn on the harbor of Catania on the east coast of the island of Sicily at the foot of Mount Etna. 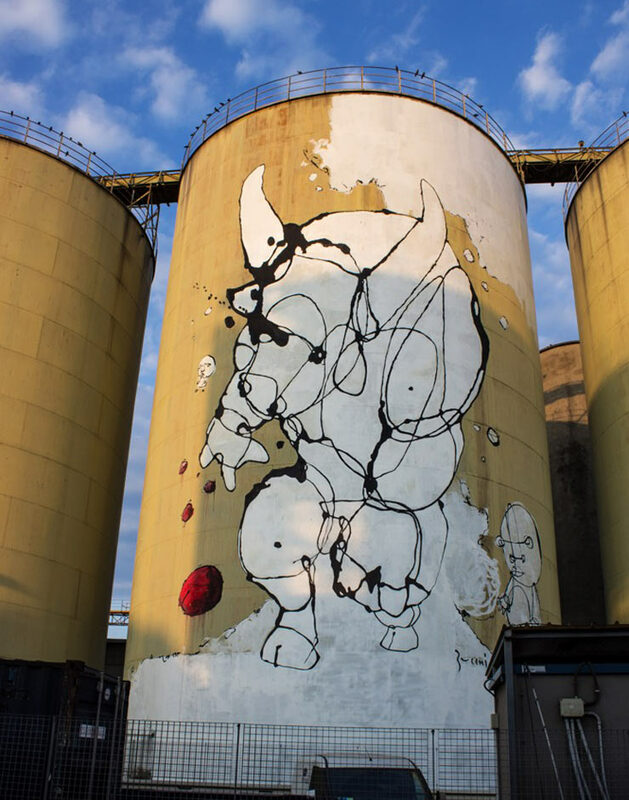 28 meters tall and facing the Ionian Sea, they are now some of the largest canvasses in Italy by a small group of international and local Street Artists. 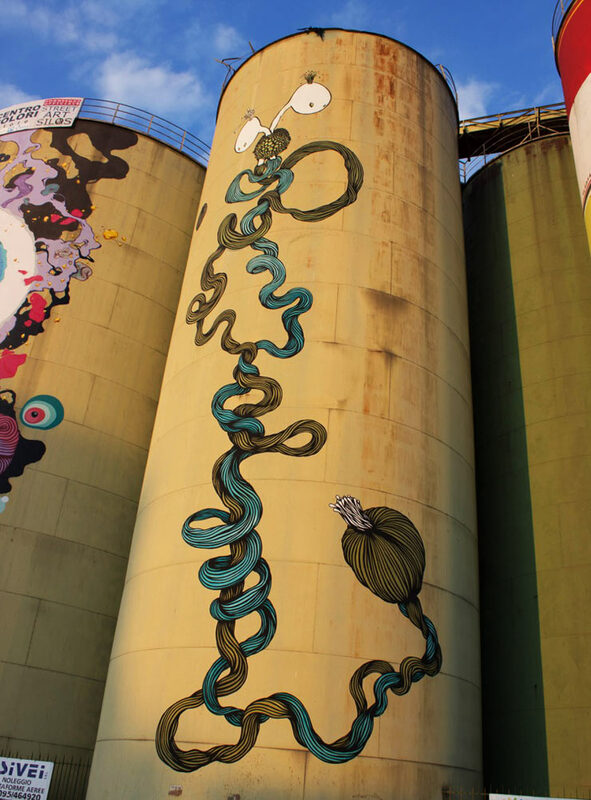 The “Art Silos” project includes works completed during an eight month installation begun in June 2015 as part of Festival “I-ART” organized by “Emergence”, thanks to Angelo Bacchelli, curated by Giuseppe Stagnitta. 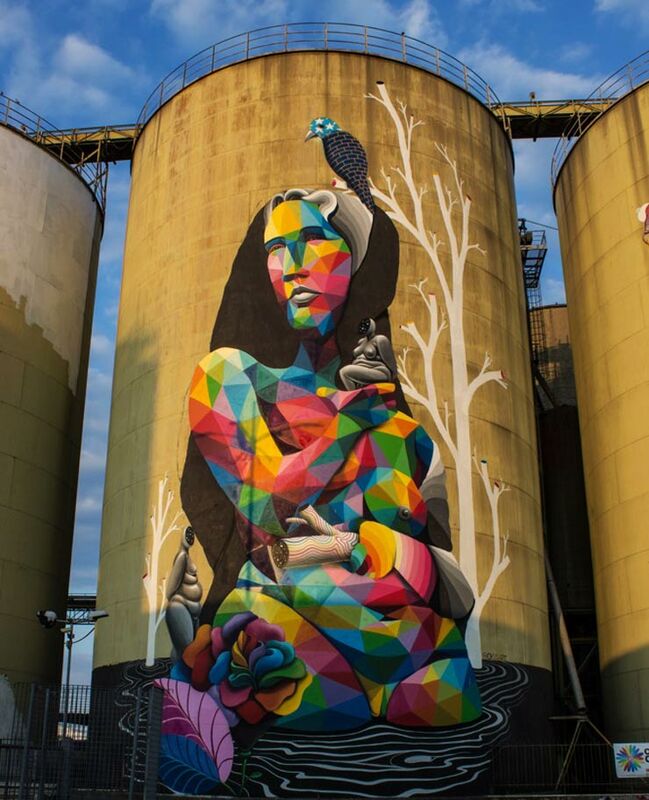 The artists taking part in the project were Okuda (Spain), ROSH333 (Spain), Microbo (Italy), BO130 (Italy), VladyArt (Italy), Danilo Bucchi (Italy) and the duo Interesni Kaxki (Ukraine), mostly all from the graffiti/Street Art world. 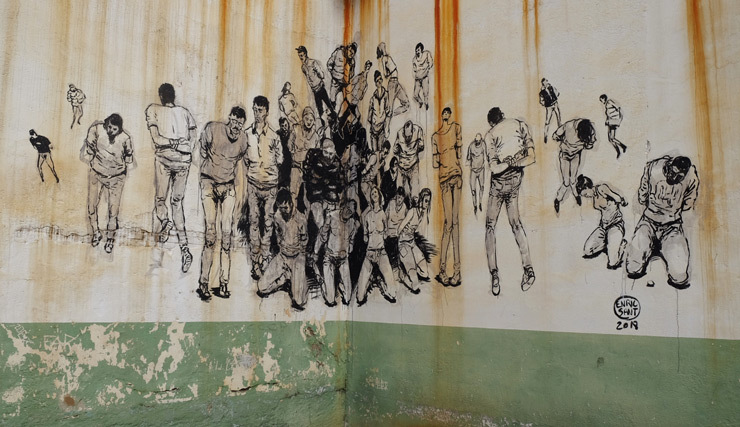 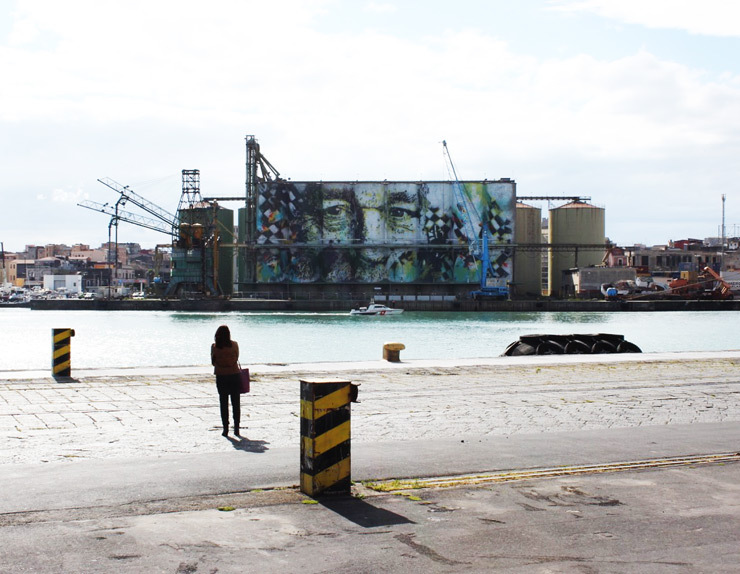 A separately organized but related project on the harbor-facing row of eight silos was completed by one artist alone, the Lisbon-based Vhils. 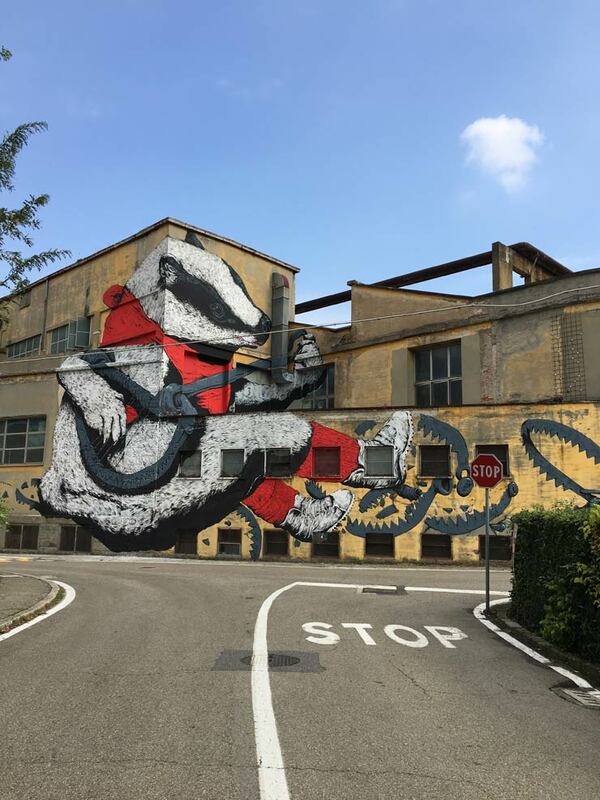 The project’s completion at the turn of the year culminated in one of the largest Street Art/Graffiti artists’ collective shows in Italy held in the city’s main public gallery Palazzo Platamone, entitled “Codici Sorgenti” (Source Code), which was curated by Stefano S. Antonelli and Francesca Mezzano from Rome’s 999 Contemporary Gallery. 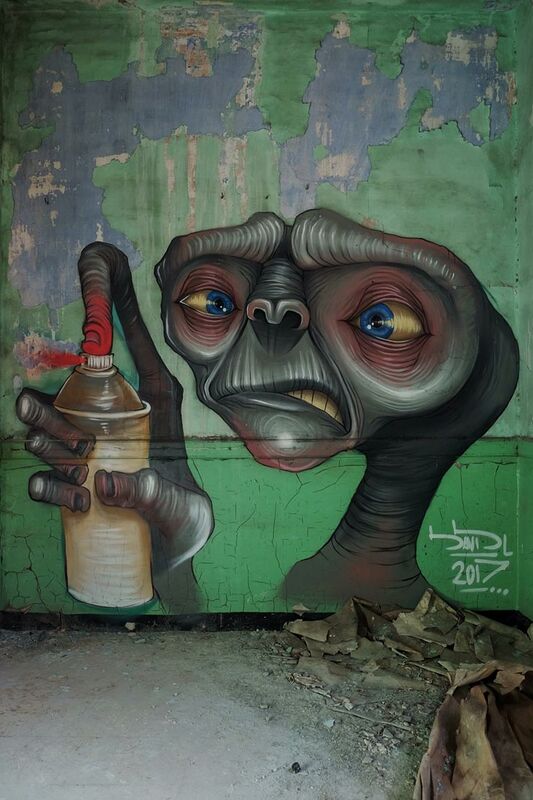 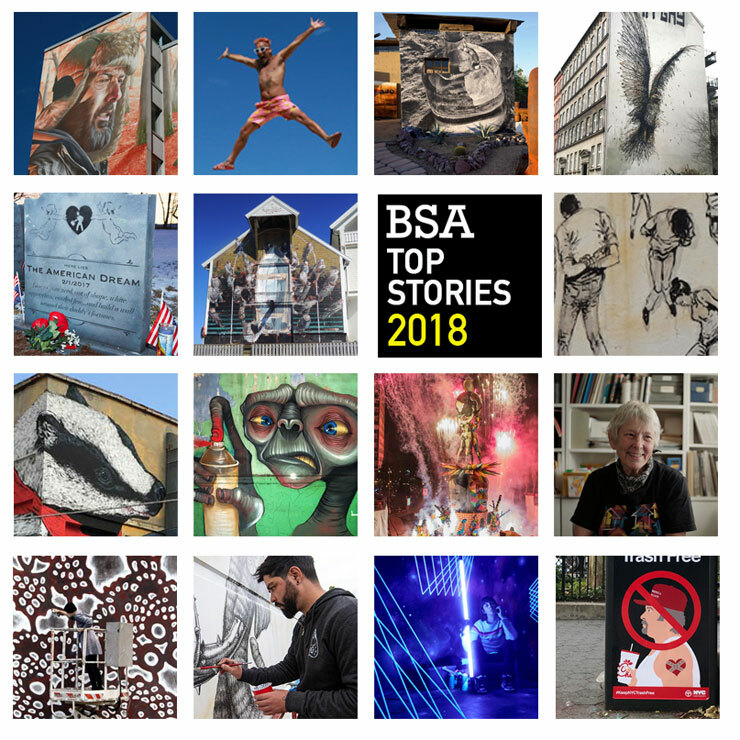 There is talk about the possibility that this exhibition of about 60 artists work will tour throughout Europe with its message of the historic roots of modern graffiti and Street Art along with many of its most impactful practitioners pushing into the contemporary art world. 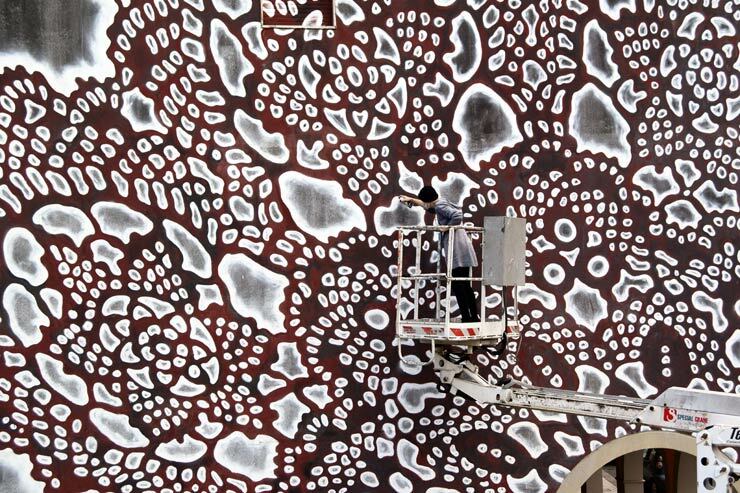 According to Arianna Ascione in Artsblog.it, the gallery exhibition was “divided into three sections that tell the birth, interactive development and consecration of the (graffiti/street art) phenomenon” Indeed, the list contains works by 108, A One, Augustine Iacurci, Alexis Diaz, Alexone, Bo 130, Boris Tellegen (aka Delta), Brad Downey, C215, Clemens Behr, Conor Harrington, Crash, Delta 2, Dondi White, Doze Green, El Seed, Ericailcane, Eron, Escif, Evol, Faile, Feitakis, Gaia, Herbert Baglione, Horfee, Interesni Kazki, Invader, Jaz, Jeff Aerosol, Mark Jenkins, Jonone, JR, Judith Supine, Kool Poor, The Atlas, Lek & Sowat, Lucy McLauchlan, Matt Small, Maya Hayuk, Mensanger, Miss Van, Momo, Moneyless, Peeta, Rammellzee, Retna, Roa, Seth, Philippe Baudelocque, Sharp, Shepard Fairey, StenLex, Swoon, The London Police, Todd James,Toxic, and the aforementioned Vhils. 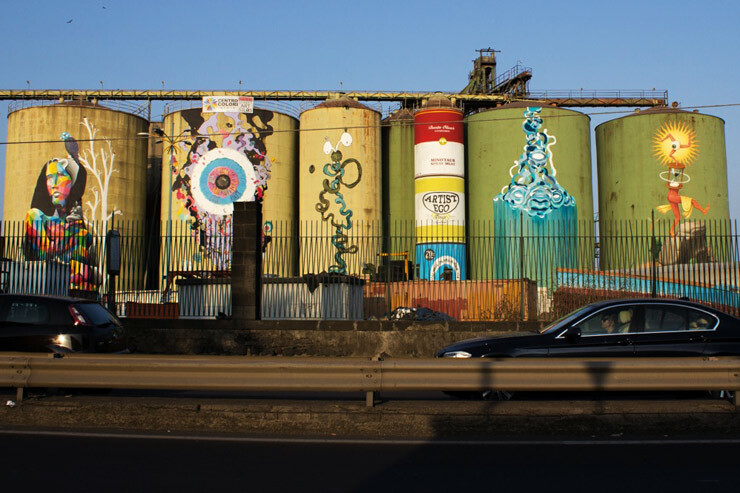 Ironically the genre-melting inclination of so-called “urban art” has eroded the silo mentality of many who follow these art forms as they become known, followed, collected, and exhibited; As a metaphor “Art Silos” may more accurately refer to the past and the dogmatic separation of genres such as graffiti, tattoo, illustration, ad jamming, and Street Art for example. 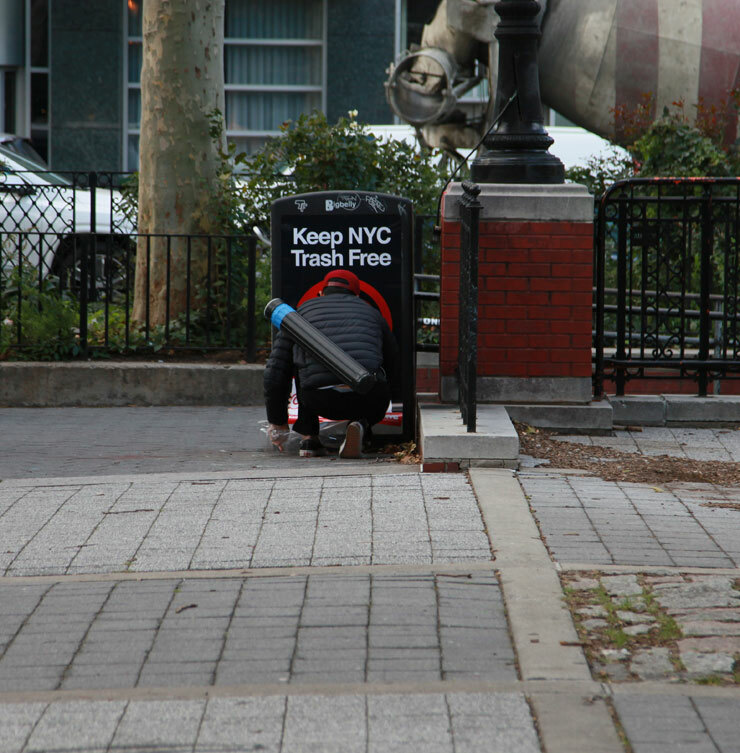 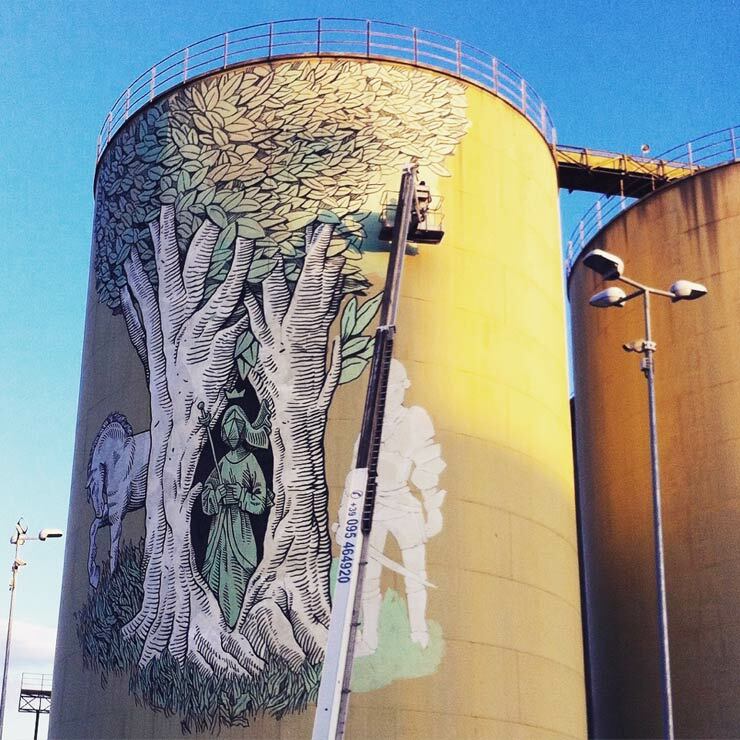 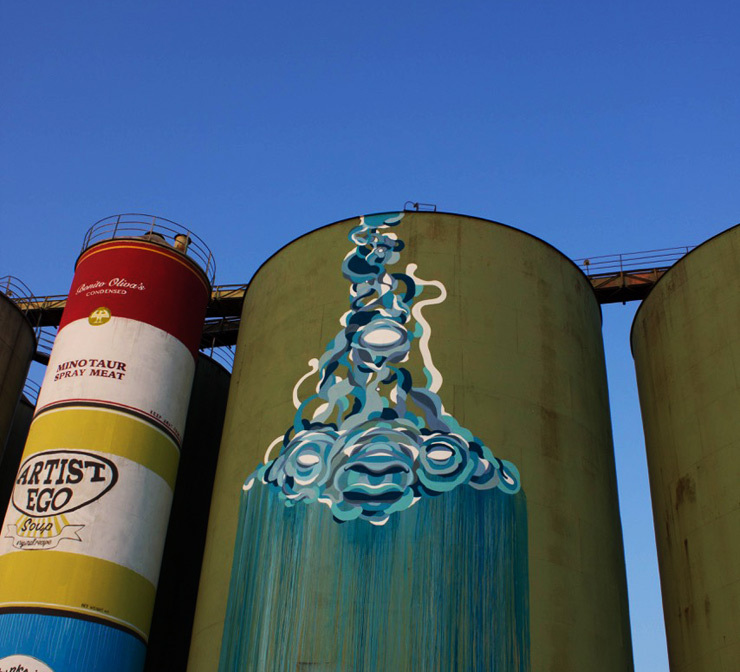 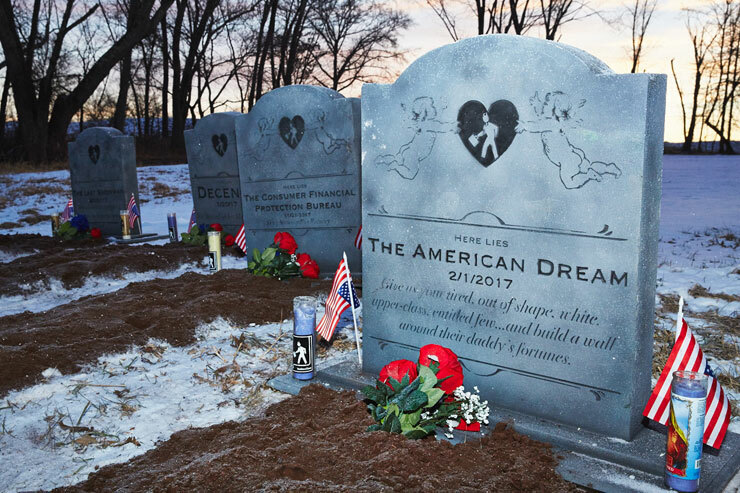 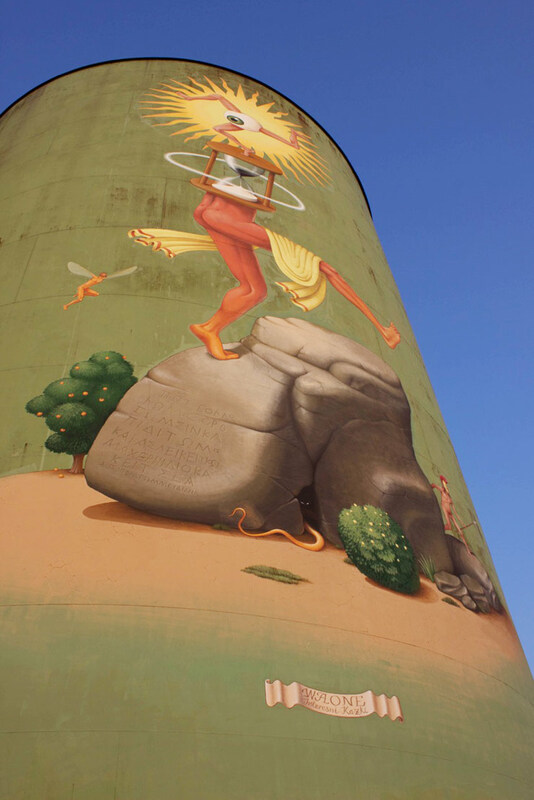 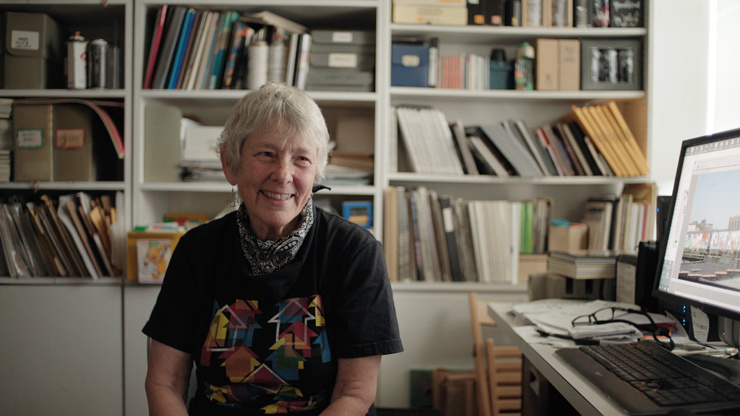 Although not strictly what you might call public art either, the scale of “Art Silos”, with its major artworks that typically may take years to be approved in large cities elsewhere, is an occurrence routinely happening in cities around the world. 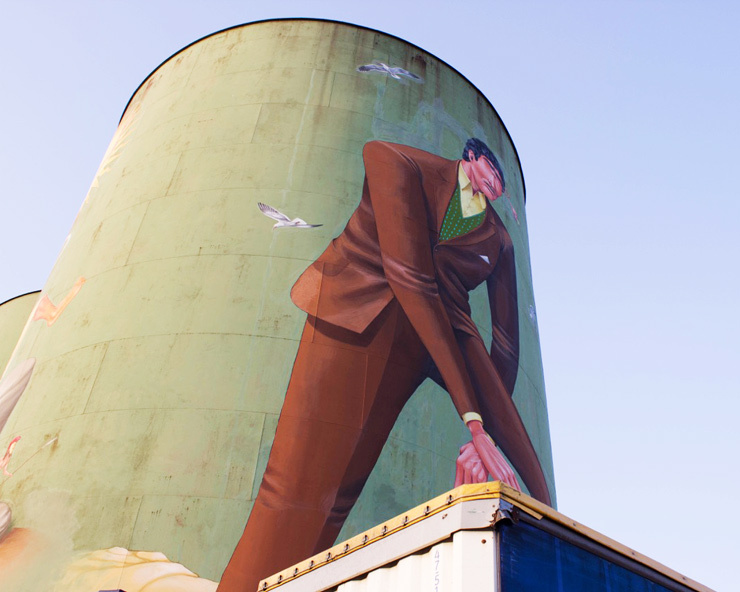 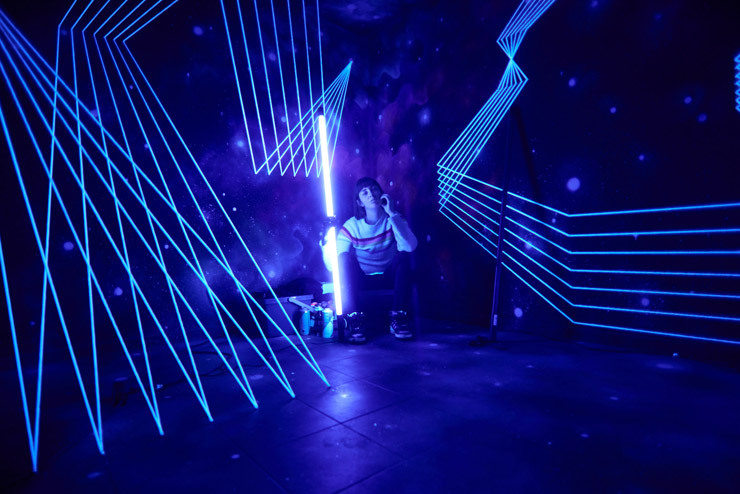 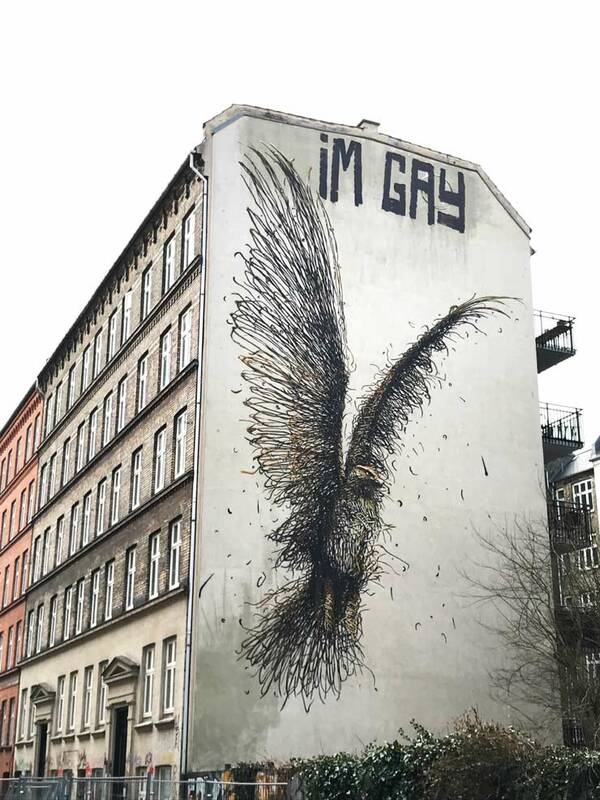 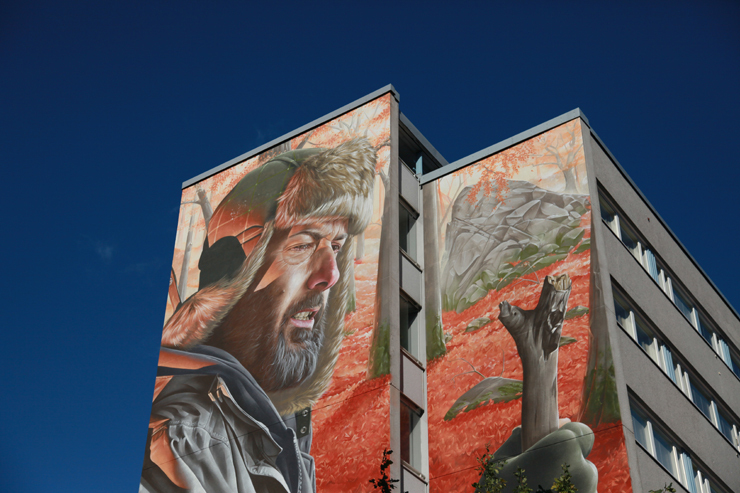 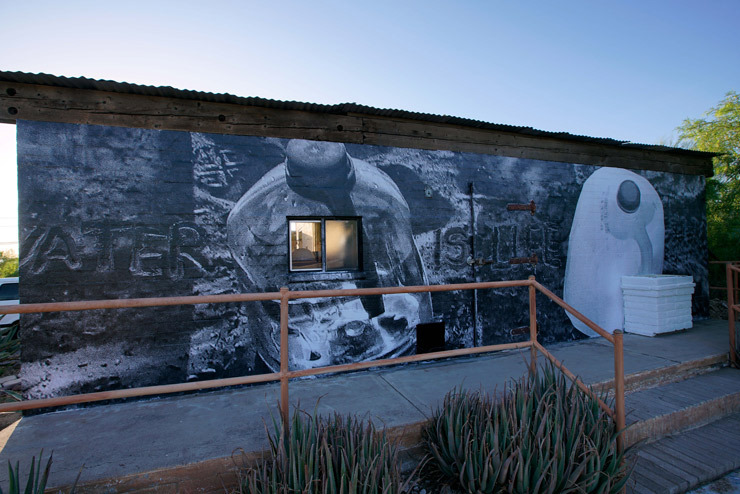 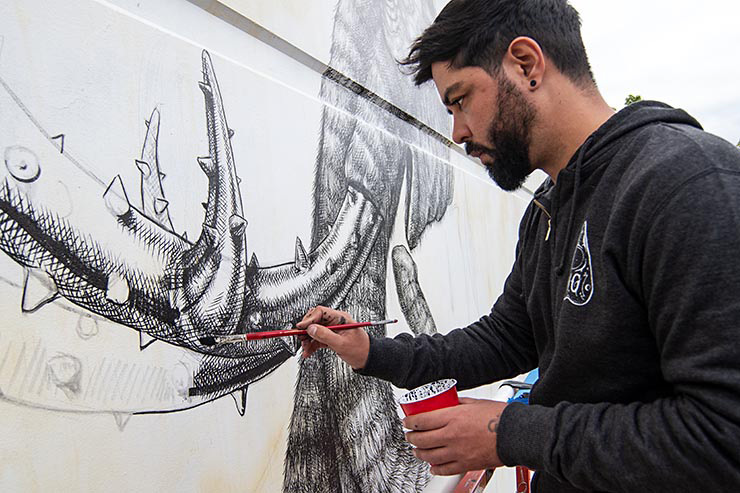 For us this is one more example of the “New Muralism” that is enabling Street Artists to do major works in public spaces via non-traditional routes. 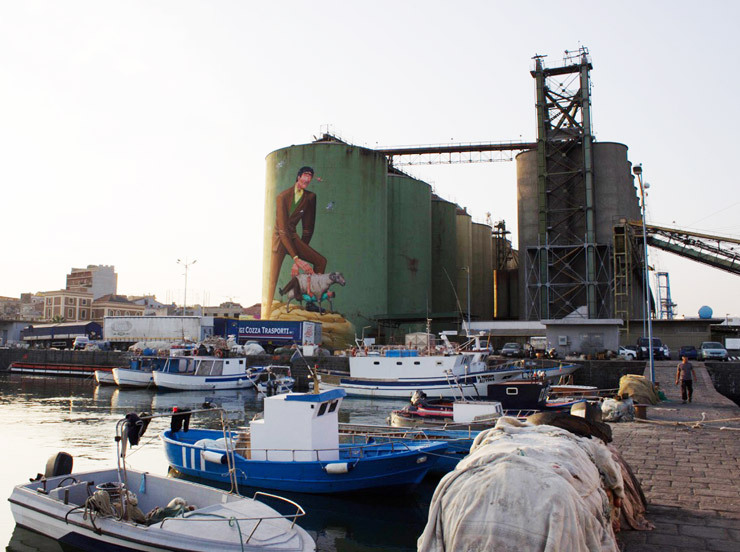 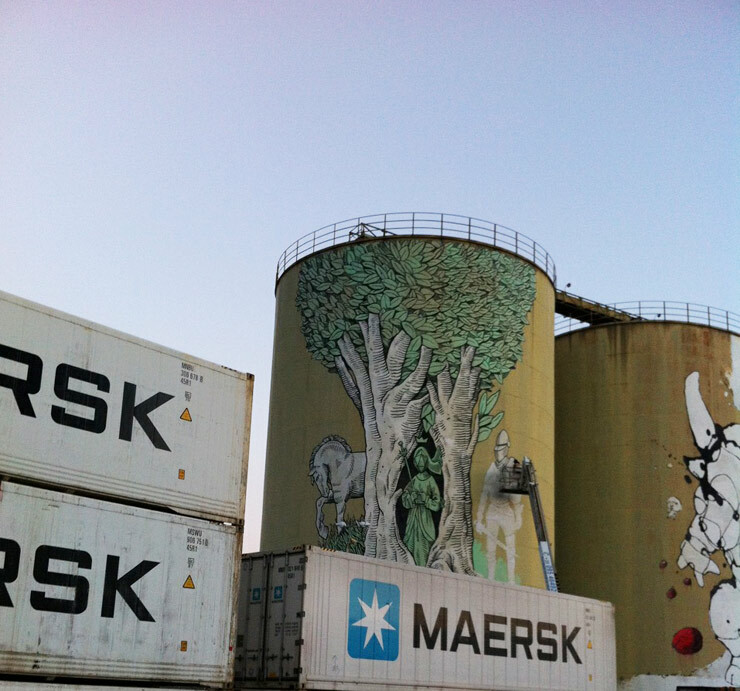 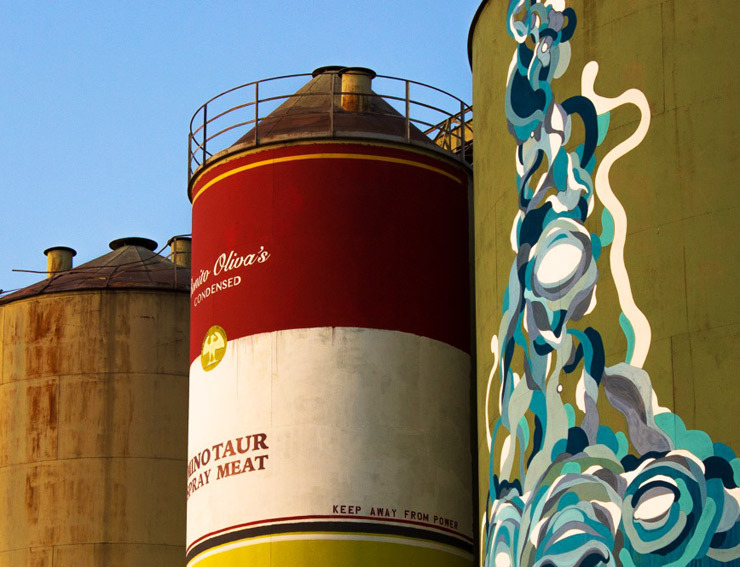 On par with a public art works of other committee-approved sorts, this silo project was a private/public collaboration that made selections, secured funding and permissions from the harbor authorities, city figures, politicians and the manager of the silos themselves, according to VladyArt, who along with Microbo is one of the artists and a resident of Catania. 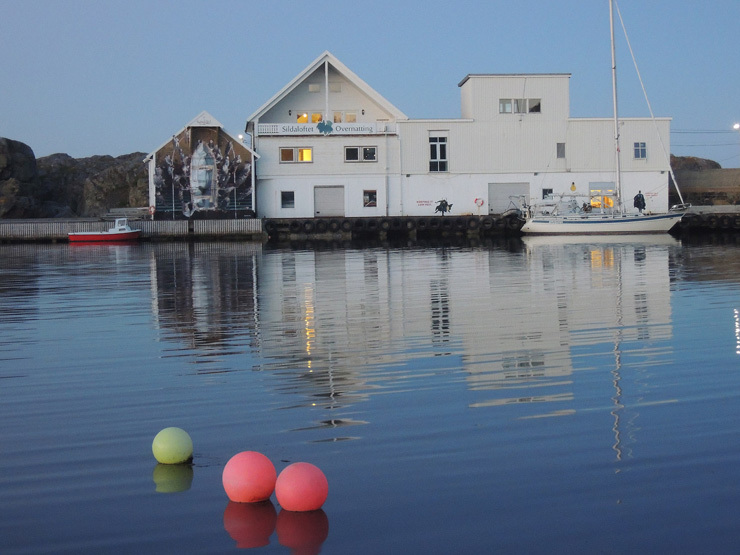 To understand why a project of this nature can happen so quickly these days, look no further than the location. 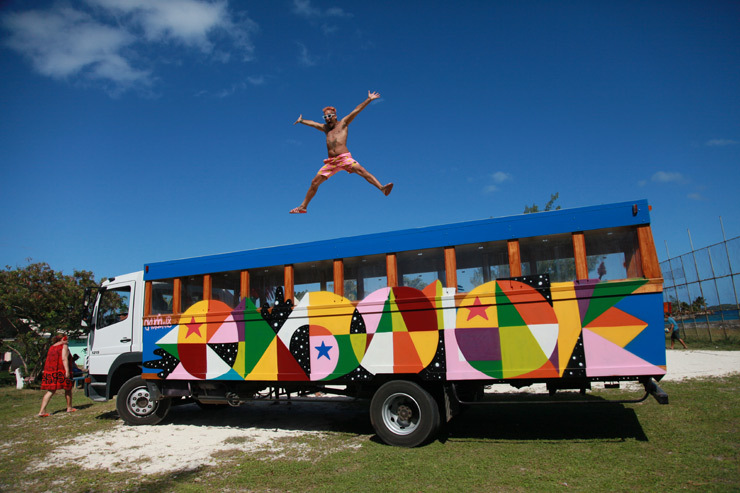 As we have recounted numerous times, often these efforts are deliberately programmed to draw attention to economically challenged areas as a way of encouraging tourism and investment. 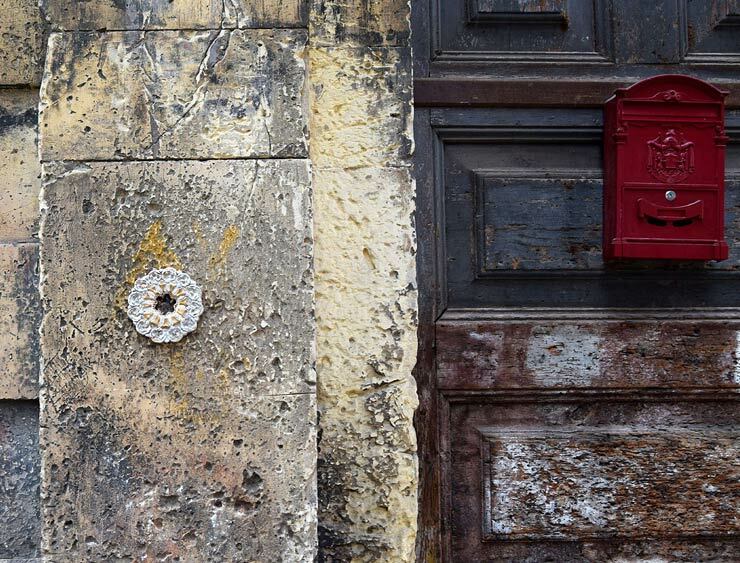 In fact VladyArt says that this historic region and city that dates back many centuries before Christ is having a very challenging time economically and socially and could use positive attention from a crowd that appreciates art. 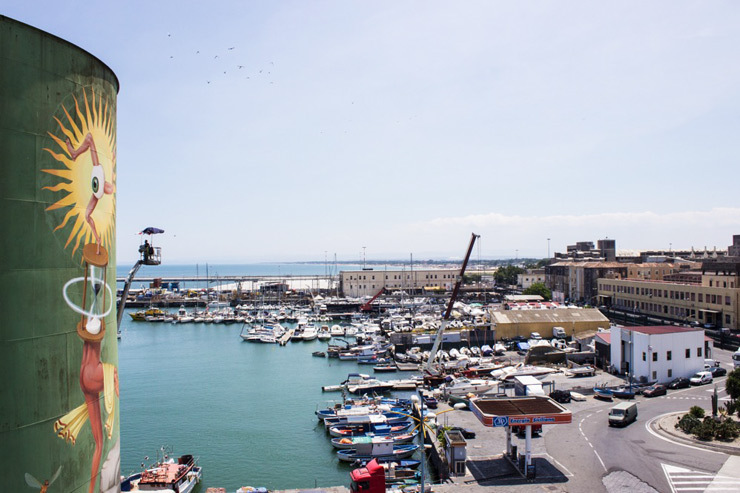 “Catania is somehow the most dynamic city of Sicily, because of its industrial and commercial features,” he says. 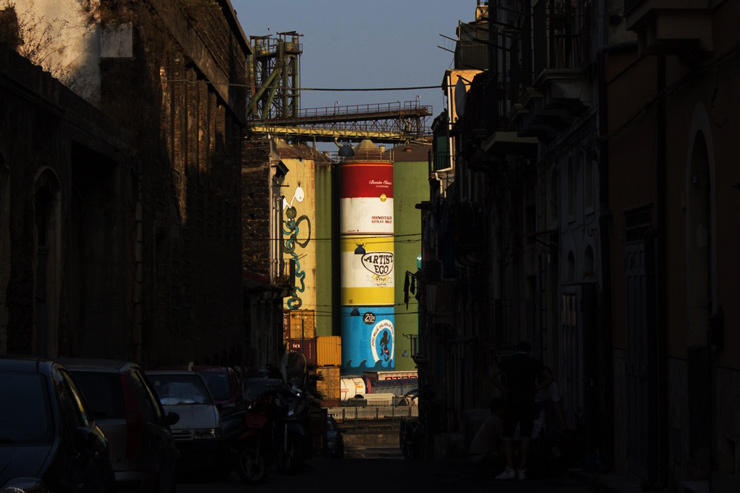 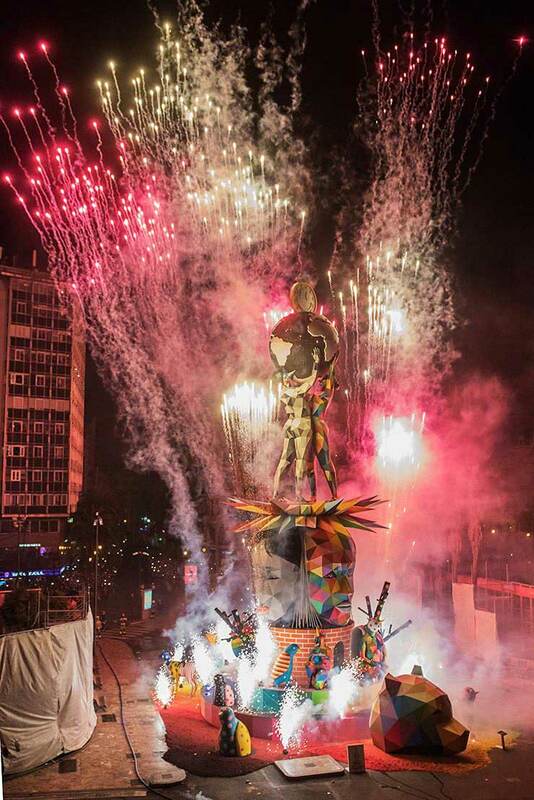 So it is all the more remarkable that a multi-artist iconic installation can happen here in Catania and people are exposed to a grassroots-fueled art scene that is currently galloping across the globe. 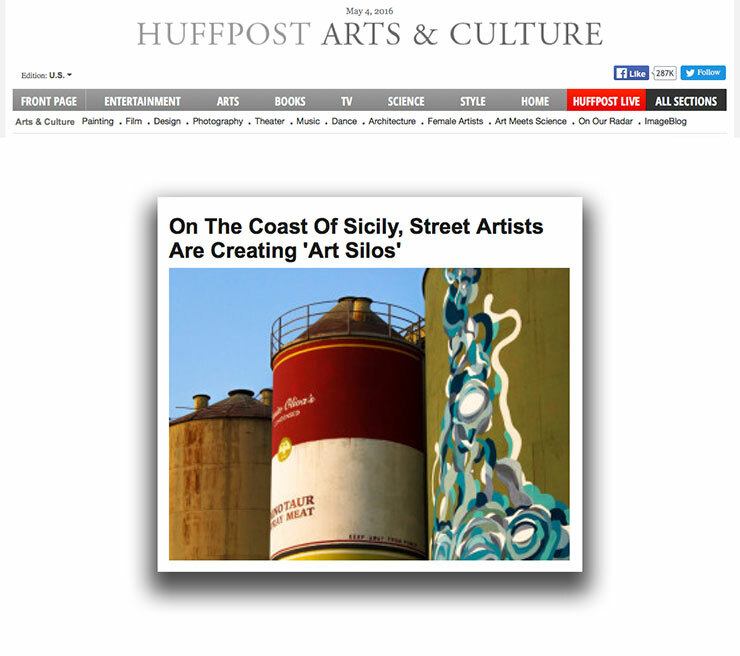 This article is also published in The Huffington Post.